Earth Day Special: 50% Off Art + Free FedEx Shipping! This offer expires April 25th, 2019, 11:59PM CDT. overstockArt.com offers free FedEx Ground shipping on all orders within the contiguous United States. There are no minimums to buy. All In-Stock items leave our facility within 48 hours so you can expect your art in 3-5 business days. Yes we do ship worldwide. FedEx International Economy ® Will be delivered Within 5 Business Days Worldwide and FedEx International Priority ® will be delivered within 3 Business Days Worldwide. Please note the shipping does not include duties and taxes. If for any reason, you are not completely satisfied with your purchase, you may return your oil paintings within a period of 45 days from the original purchase date -- all we ask is that you send the painting and frame back to us in the original box. Shipping a Return is FREE for customers receiving an exchange or store credit. There are no return shipping charges for orders originally shipped to a destination within the contiguous United States that are to receive an exchange or store credit. Please note return shipments must also be shipped from the United States. Customers must retain their original packaging for all returns. If you are shipping to Canada, just choose the Canada Shipping method from the Shipping options menu during checkout. All Canada Shipments are $40 and will be shipped 'FedEx Express Shipping' so they will arrive in 3-6 days! EARTH50 Offer: 50% Off applies to paintings, prints, ornaments and tiles only, and does not include frames and framing services. If you choose a painting and a frame the discount will only be applied to the painting. This offer cannot be applied to previous or pending purchases. It cannot be combined with any other offers and discounts and does not apply to the purchase of gift certificates, doorbusters, custom size orders and special orders. **If a painting is returned damaged and not in its original packaging (with protective corners and box) a fee will be issued against the credit due for the returned item. Not to exceed the full purchase price and no less than 1/2 the value of the item if item arrives in unsellable condition. Classic 20" X 24" Need a different size? Just select "Afterpay" as your form of payment at checkout on orders of $35-$1000. All you need is a debit or credit card (Visa or Mastercard). To be over 18 and the legal age in your state of residence. No long forms to fill out; you’ll receive an instant approval decision! Your order will be shipped as soon as it’s processed by overstockArt.com. No interest, ever — and no additional fees when you pay on time. * Automatic payments are taken every two weeks in four equal installments. * If funds are not available at the time an automatic payment is due, you will be charged a late fee of $8. If left unpaid an additional seven days, another fee of $8 will be charged. However, total late fees will not exceed 25% of the total order. New Age Black Frame 20"X24"
Studio Turquoise Metal Frame 20"X24"
Studio Emerald Metal Frame 20"X24"
Gallery-wrap is a modern style of displaying art over thick wooden bars. It is a stretched canvas that doesn't have any visible staples or nails holding the fabric to the wooden stretcher bars so the painting could be hung unframed. Gallery-wrap is a very popular way to display art, however, because the edges of the canvas are wrapped over the thick bars, about two inches of the painting from each side are lost in the wrap. A Certificate of Authenticity arrives with every painting to verify the authenticity and provide assurance that you are receiving a hand painted reproduction of the highest quality. Once you have selected the perfect painting, we have a wide selection of beautiful frames to suit any taste or budget. Art will arrive stretched and ready to hang with hanging hardware included. In stock orders typically ship within two business days of the order being placed and we offer free Fedex ground delivery to anywhere in the continental US. Global shipping available. We provide outstanding customer service via email, telephone or with our online chat option to provide you with the best possible customer experience both during and after your purchase. The painted canvas is 20 Inches wide and 24 Inches tall. 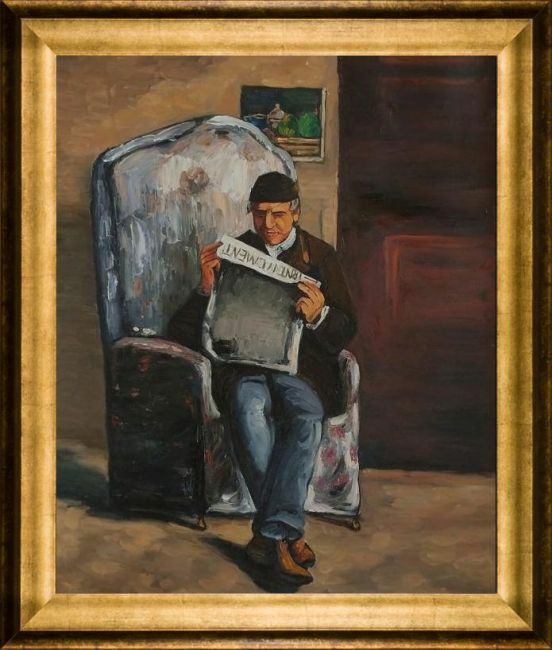 Painting Size: Classic 20" X 24"
20" X 24" Oil Painting On Canvas Hand painted oil reproduction of a famous Cezanne painting, Artist's Father Reading. 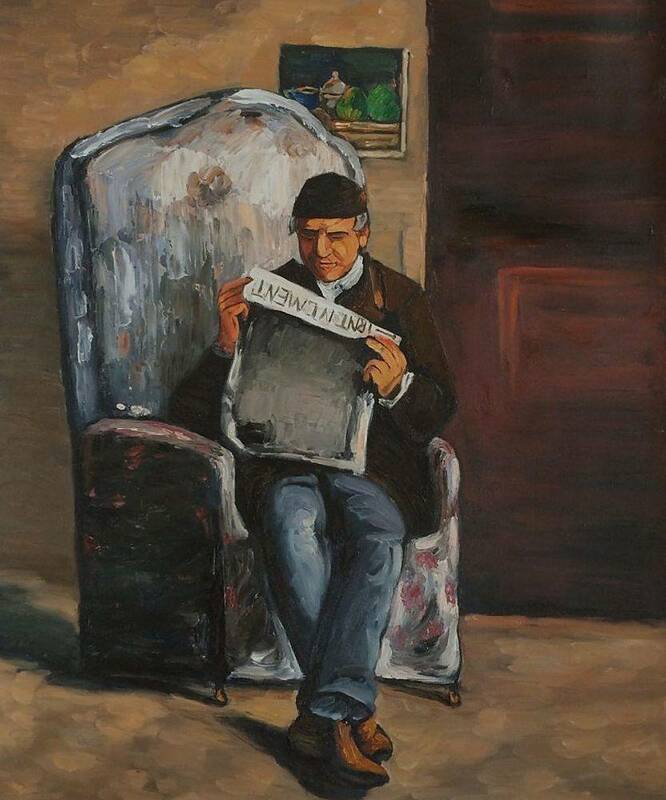 The originally french titled piece Levenement was created in 1895. Today it has been carefully recreated detail by detail, color by color to near perfection. 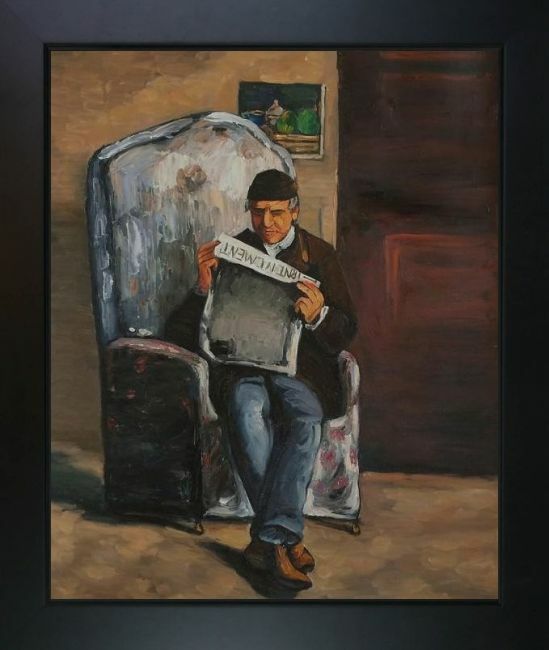 Paul Cezanne is identified today as the most dominant influence in the abstraction of modern art. 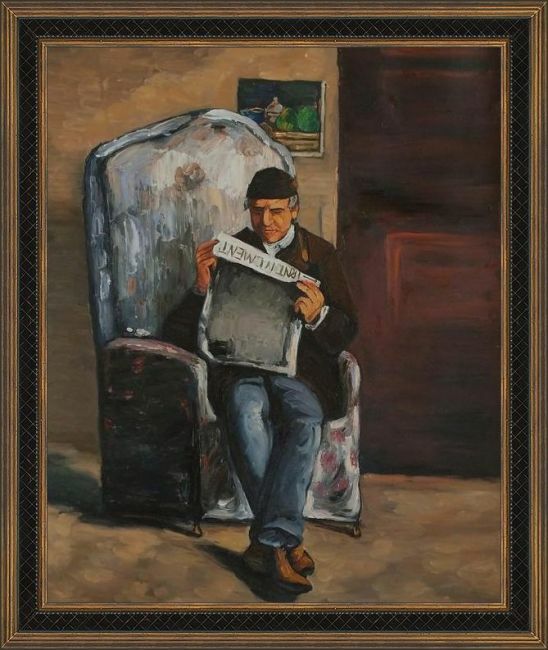 Cezanne drew influence from Pissarro and Manet early in his career. 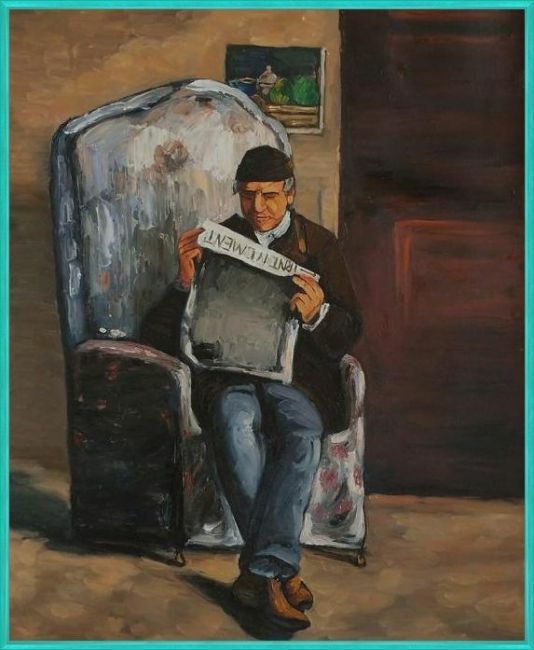 As he matured, Cezanne mostly portrayed still lifes in his art and has greatly influenced Cubism, a form of painting. This work of art has the same emotions and beauty as the original. Why not grace your home with this reproduced masterpiece? It is sure to bring many admirers! 45-day Easy Returns Policy. Enjoy Free Shipping. Remarkable selection of museum-quality frames to complement this painting. When ordering a frame with your painting it will arrive ready to hang on your wall with hanging hardware included. Hand crafted means unique to every owner. Each canvas reproduction may vary slightly in brush details due to the nature of being hand painted so no two paintings are the same. 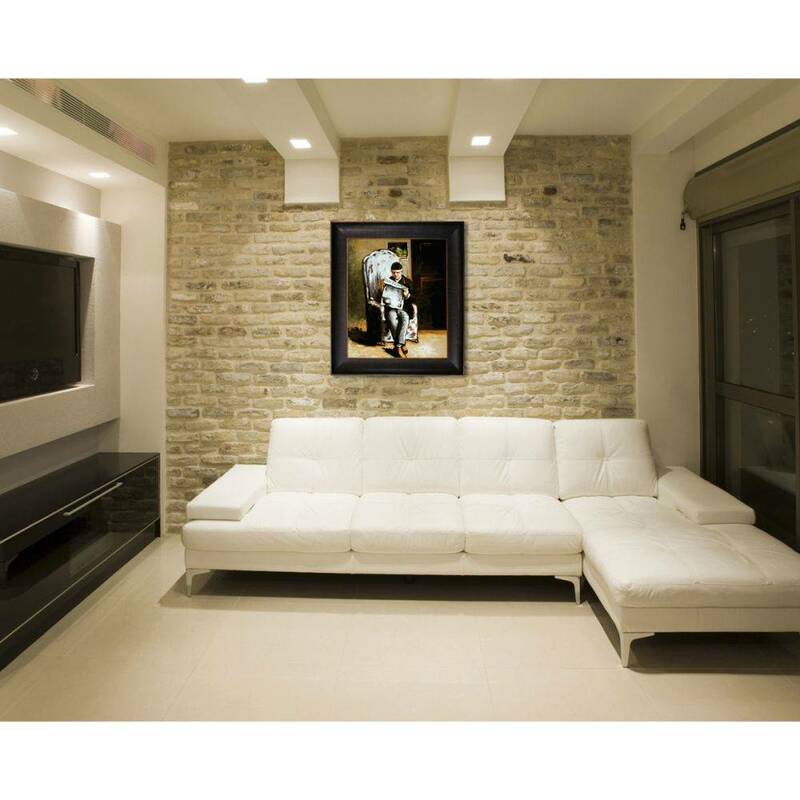 Art will come unframed, rolled in a tube unless a frame or framing service is selected. Yes shipping is FREE. overstockArt.com will ship your order free as long as you choose ground as your shipping option. There are no minimums to buy. overstockArt.com ships via FedEx Ground. Yes we do ship worldwide. For shipping outside of the US, just choose the appropriate International Shipping option during checkout. International shipping costs vary according to your shipping address and you will be quoted after your have placed your order. If for any reason, you are not completely satisfied with your purchase, you may return your oil paintings within a period of 45 days from the original purchase date -- all we ask is that you send the painting and frame back to us in the original box. We'll even pay the shipping for returns that receive an exchange or store credit. Our FREE shipping and returns policy is only valid in the contiguous 48 states. All orders are guaranteed to ship within 48 hours unless product is back ordered. Most orders ship same day as long as they are placed prior to 2:00pm CST. No returns accepted for custom or special orders. Returns seeking a refund may be subject to a return shipping charge based upon the size of the order, ranging from $10-$100, as of August 20th, 2016, and may take up to 30 days to process. Subject to credit approval. See terms. US customers only. View your future painting in a room. Your feedback is very important for overstockArt.com, so we could be even better.